Stem rust (or black rust), named for the blackening pustules that infect plant stems, caused devastating crop epidemics and for centuries before being tamed largely by use of resistance genes. Since the turn of the century, however, aggressive new strains have emerged – such as ‘Ug99’, first detected in Uganda in 1999 – that infect widely grown varieties of wheat. These diseases threaten to disperse trillions of pathogenic fungal spores on winds across countries and continents. Another important scenario for wheat rust to spread is from Yemen through Middle Eastern countries, in particular Iran, to Central and South Asia. If Iran were to suffer a moderate outbreak of Ug99 – on more than 1000 hectares – then spores would likely spread to Afghanistan, and from there potentially further to the northern plains of Pakistan and India. However, transmission along this route is restricted to a relatively short time-window in March and April, before wheat is typically harvested in South Asia. Network map of the atmospheric transmission of spores causing wheat stem rust. 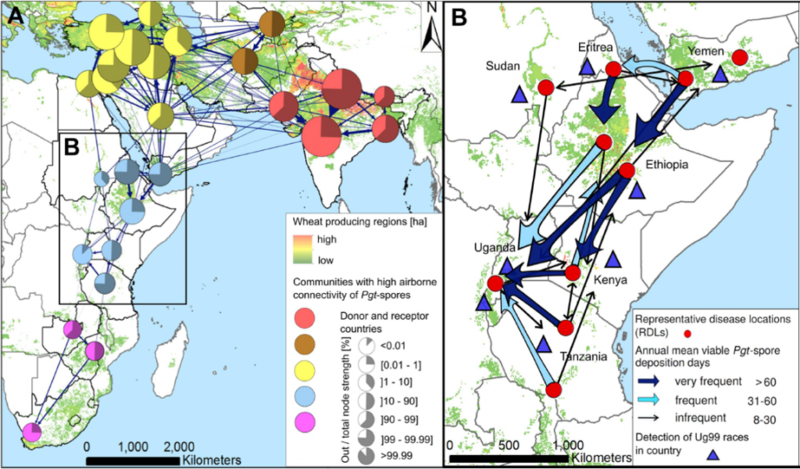 (A) Long-distance dispersal network of spores between all major wheat producing countries in Southern/East Africa, the Middle East and Central/South Asia. Nodes represent countries; communities of the same colour indicate regions with high airborne connectivity; the size of nodes indicates node-strength; pie charts show the fraction of out-strength to total node strength (indicating donor and receptor countries). (B) Spore transmission frequencies along principal migration routes in the Rift Valley zone for the scenario of large outbreaks. The scientific team used field disease surveys from the International Maize and Wheat Improvement Centre (CIMMYT) and weather data from the UK Met Office as key input for the modelling framework. The team say their work, including 3-D spore dispersal animations and a catalogue of spore dispersal trends (indicating likely directions, frequencies, pathogen loads), provides new ways to raise awareness, communicate risks, and inform agricultural stakeholders. Their modelling framework can be applied as a tool to analyse risks in case new disease strains should be uncovered in other geographic areas. This has already recently helped in estimating dispersal risks from detection sites of related wheat rust diseases in Europe and Siberia. In ongoing work the team is developing an Early Warning System forecasting disease risk in Ethiopia, East Africa’s largest wheat producing country.